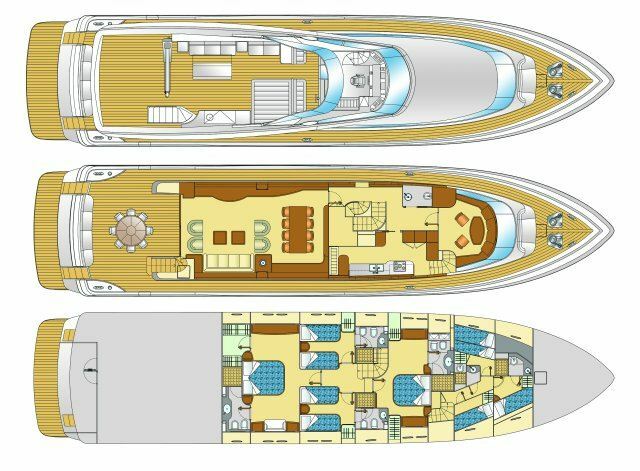 Charter yacht ZAMBEZI (ex SELULA) was designed by naval architect Carlo Galeazzi and built by Technema Posillipo in 2005. 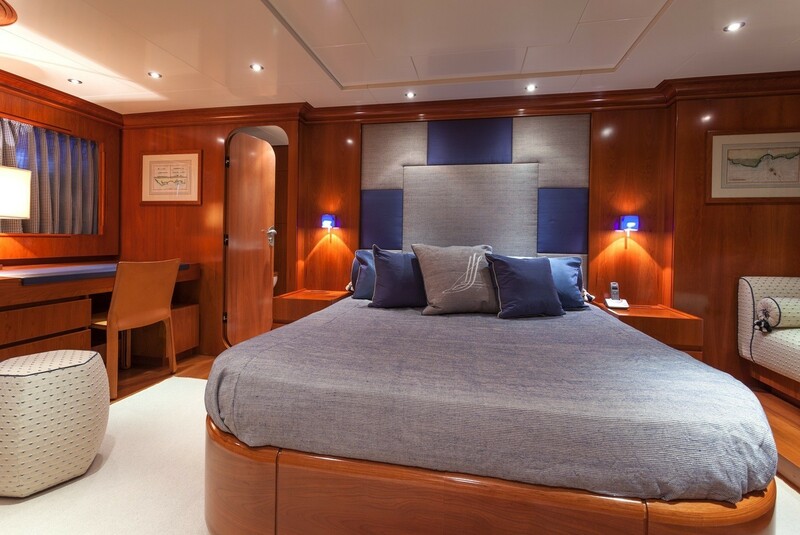 In 2013 M/Y ZAMBEZI entered the charter market offering accommodation for up to 10 guests in 4 en-suite cabins, she is available throughout the Mediterranean. 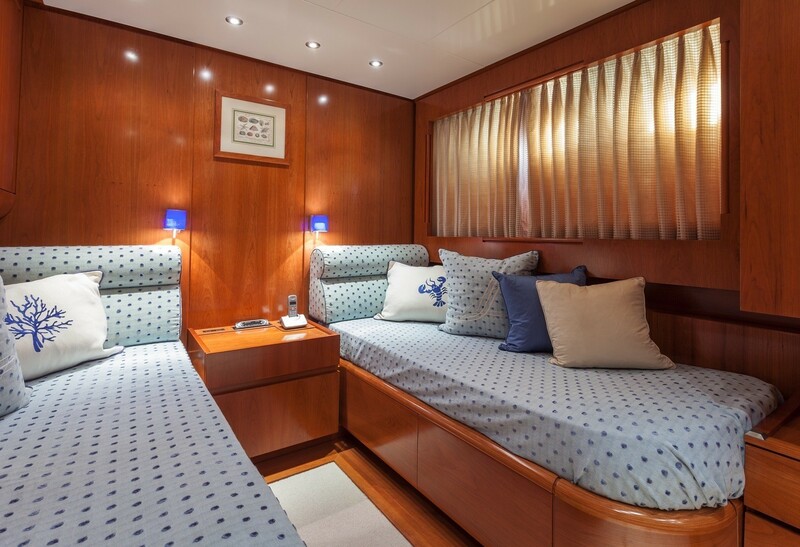 Motor yacht ZAMBEZI has a spacious warm interior combining elegance, comfort and technology. 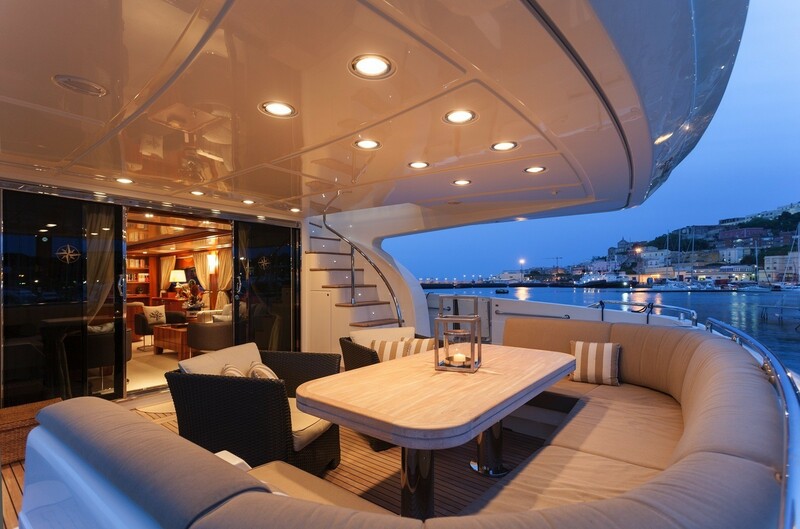 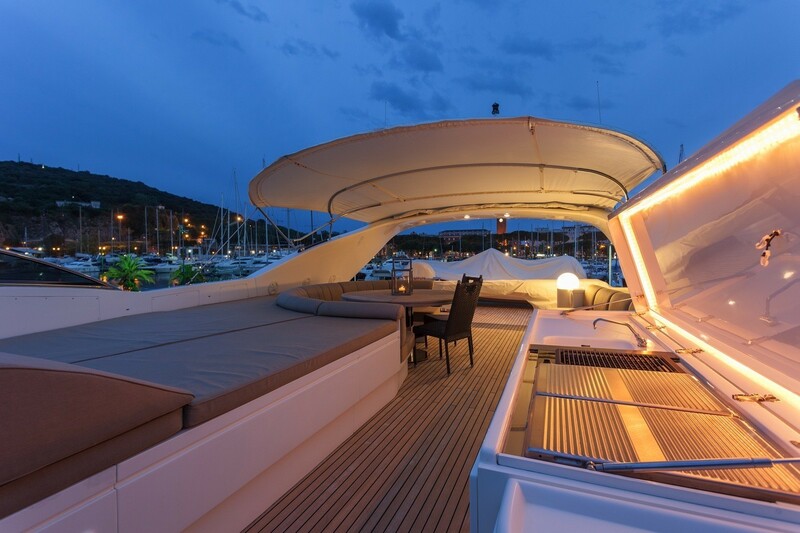 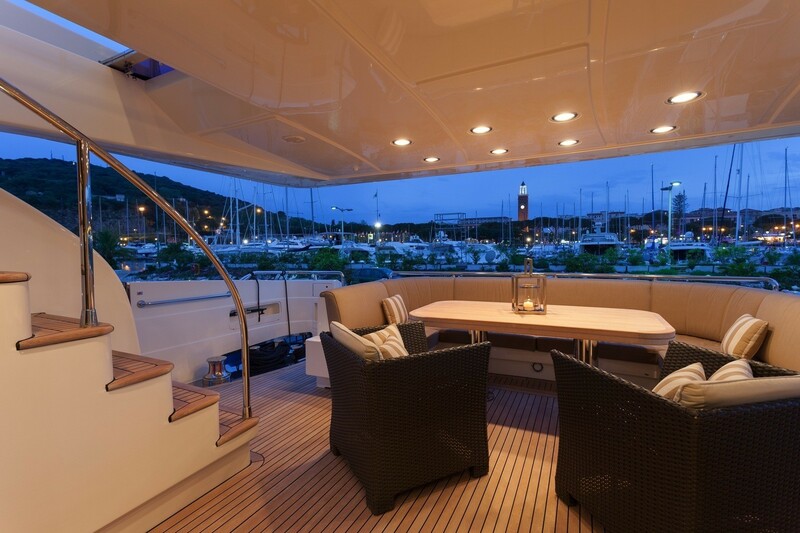 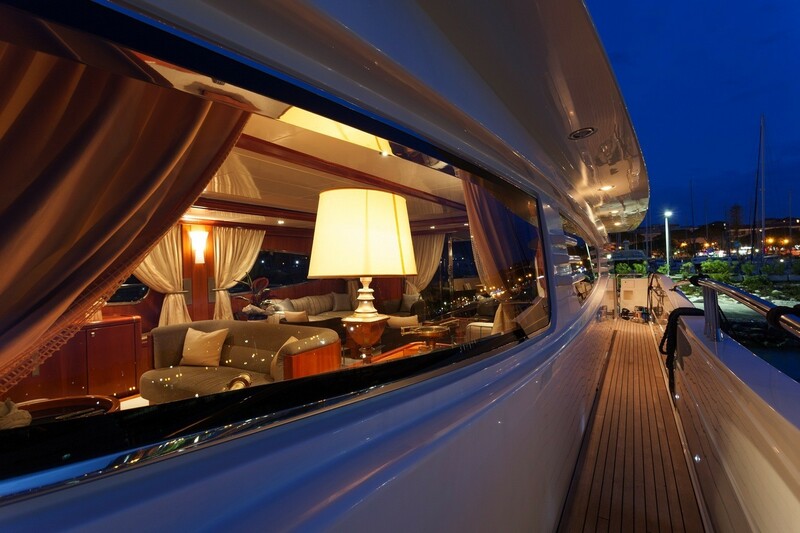 The salon is on the main deck and surrounded by panoramic windows for optimum light. 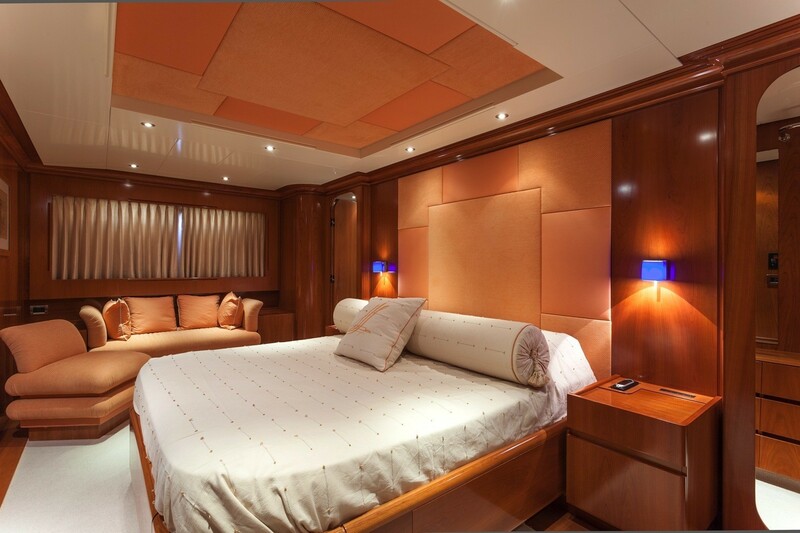 The panels are a medium cherry tone with lighter floors and contemporary neutral soft furnishings bring a deluxe ambiance. 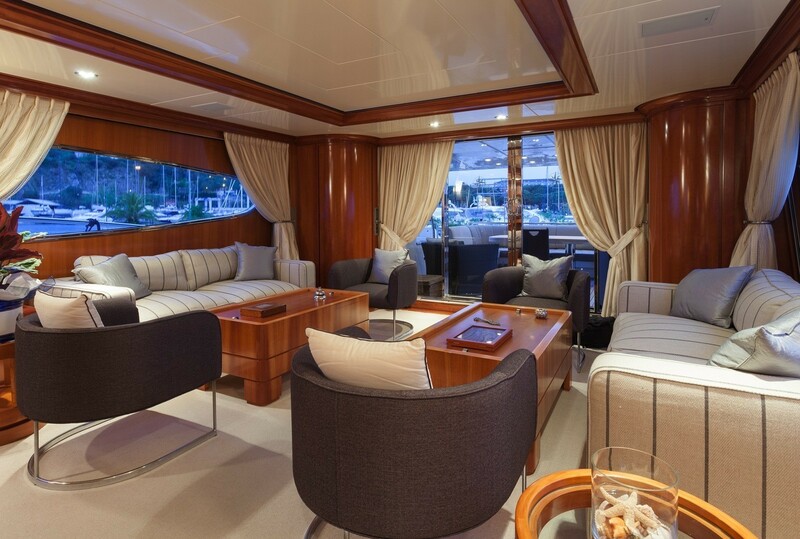 The salon has two large plush sofas, 4 occasional chairs and coffee tables that enable everyone to be comfortable. 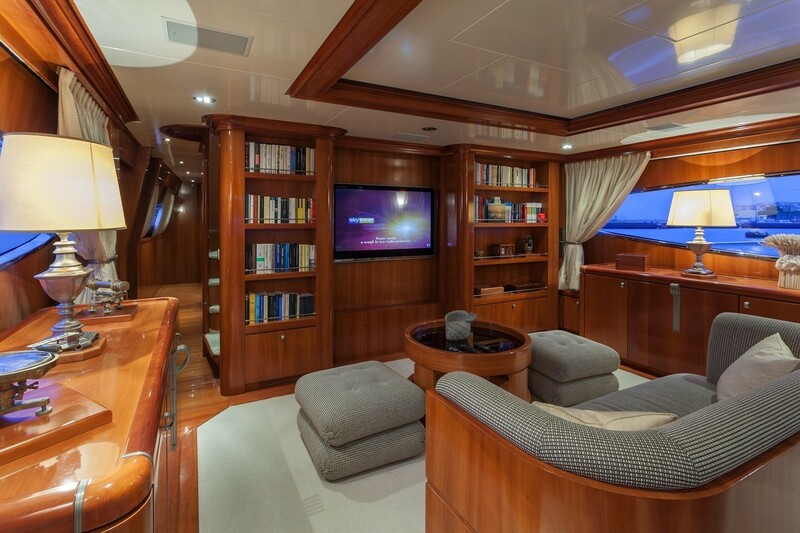 Slightly forward of the lounge an additional sofa with coffee table and ottomans face the large flat screen TV and entertainment system. 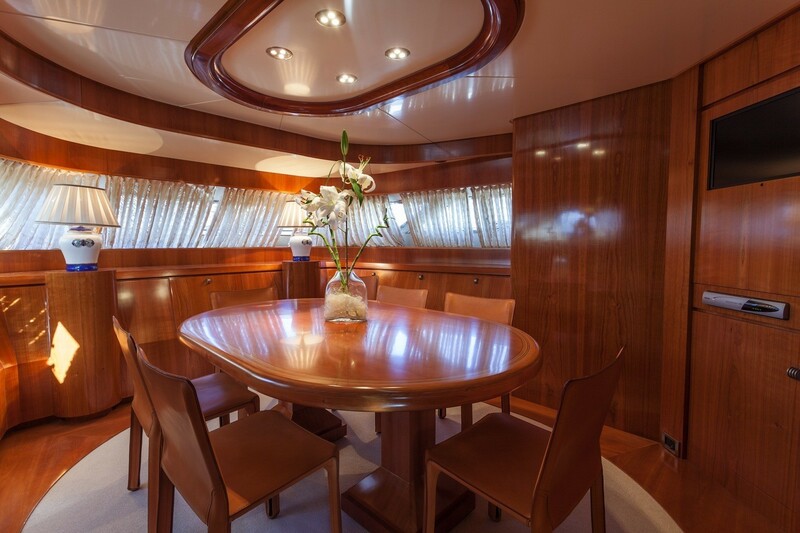 Separate and further forward, a formal dining table is ideal for 8 guests. 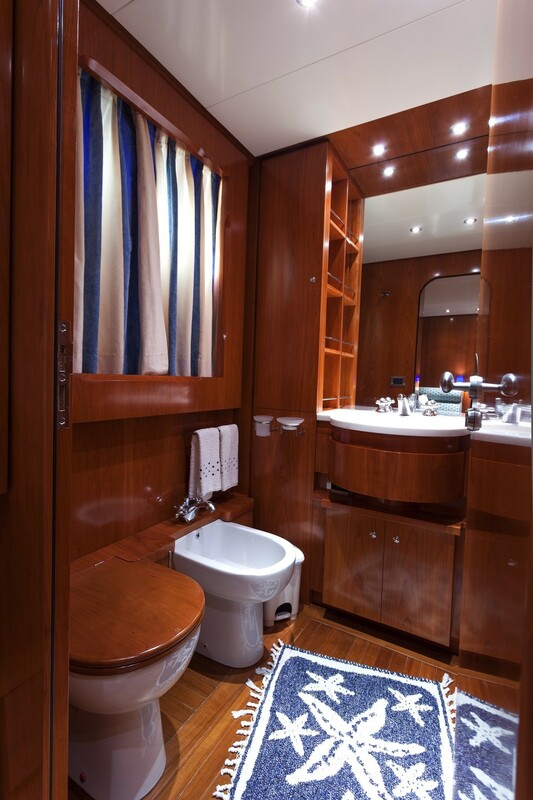 Exterior living aboard the M/Y ZAMBEZI is generous and well equipped. 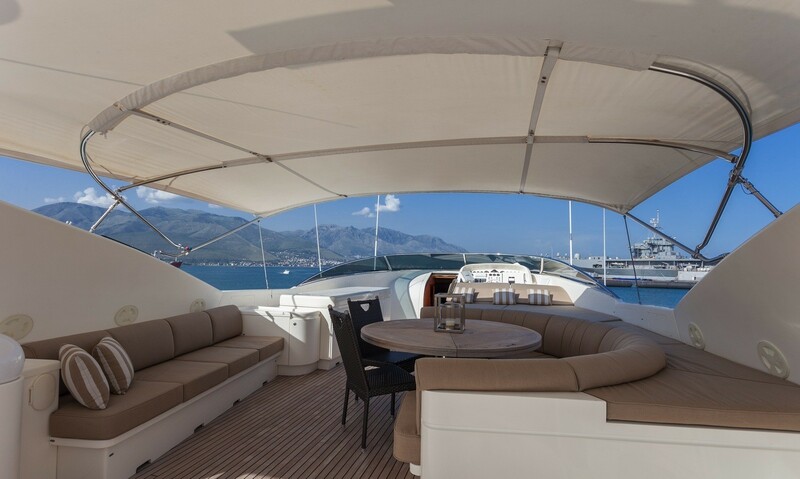 The aft deck offers an alfresco dining option and large seating area, the upper deck overhangs creating a shaded environment. 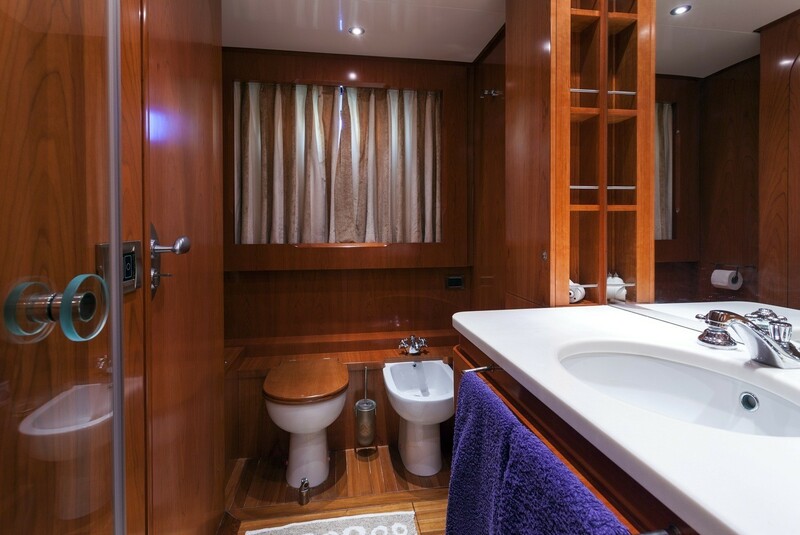 Further aft the transom boasts an extended swim platform, ideal to enjoy the many water toys on offer including a Jet Ski. 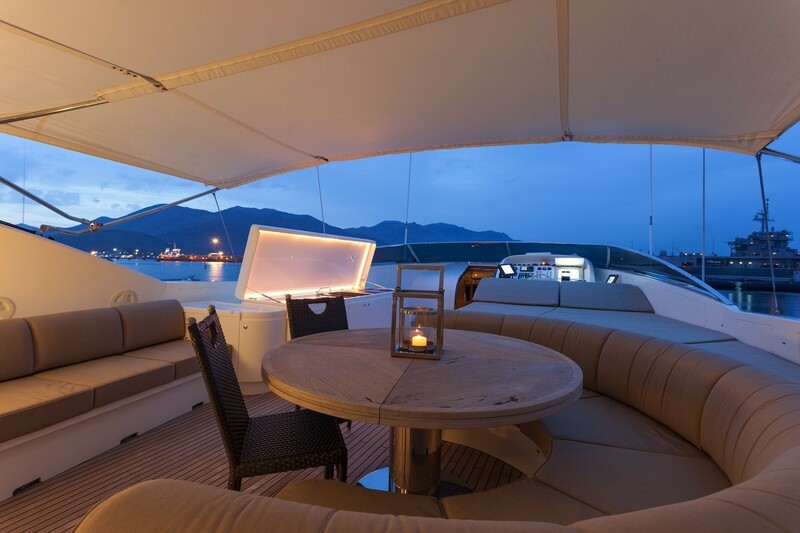 Above the main deck, motor yacht ZAMBEZI boasts a capacious flybridge offering an additional alfresco dining option, ample seating, large sunpads, removable Bimini cover and full-service area with BBQ grill, perfect for entertaining large groups of friends or family. 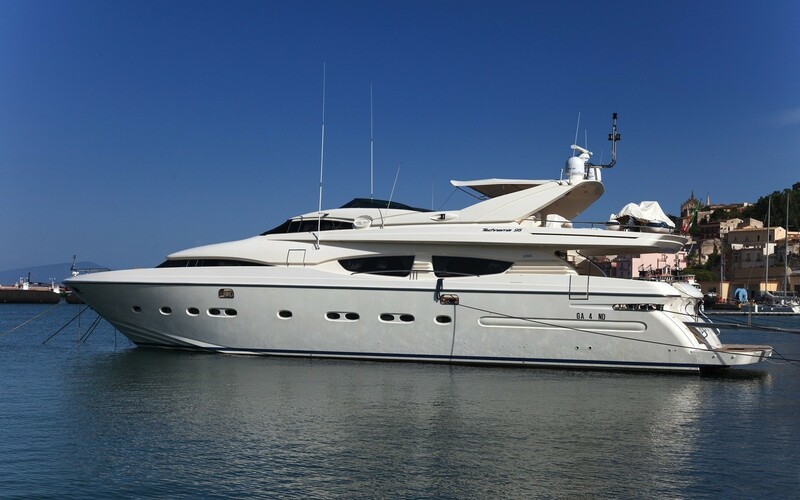 Charter yacht ZAMBEZI has a professional crew of 4 to ensure a memorable relaxing holiday experience. 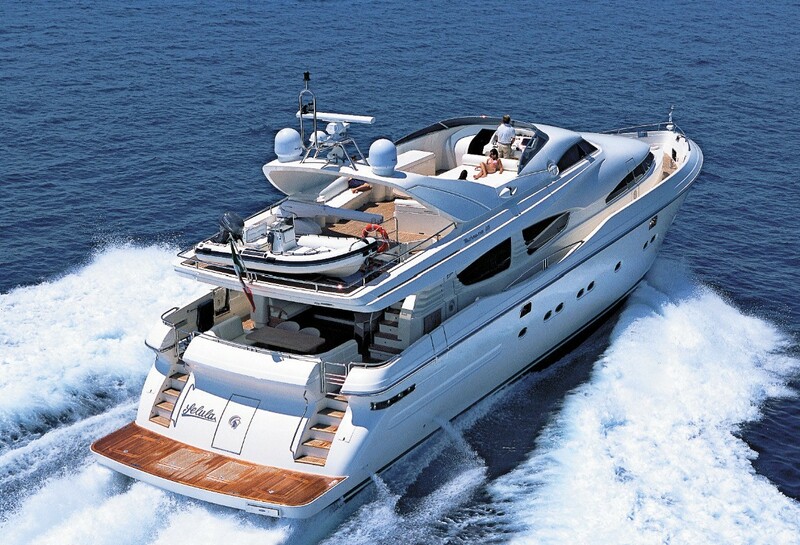 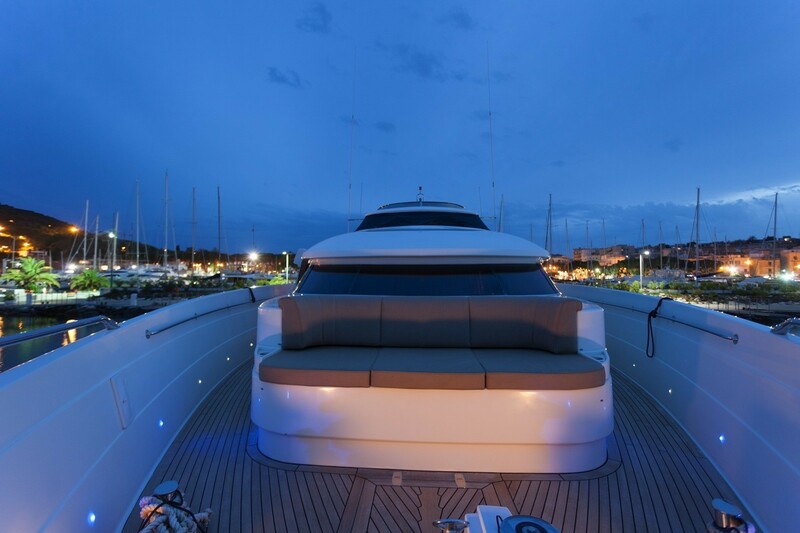 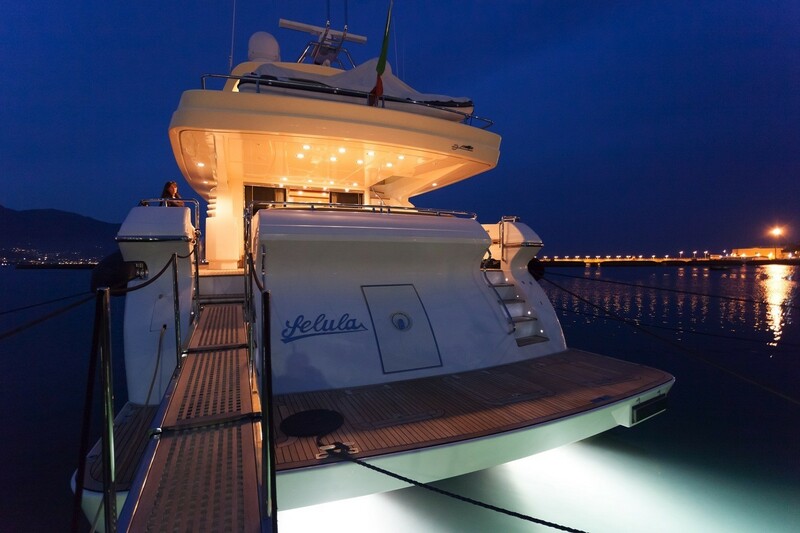 The yacht is powered by 2 MTU 2000hp engines and easily cruises at up to 23 knots. 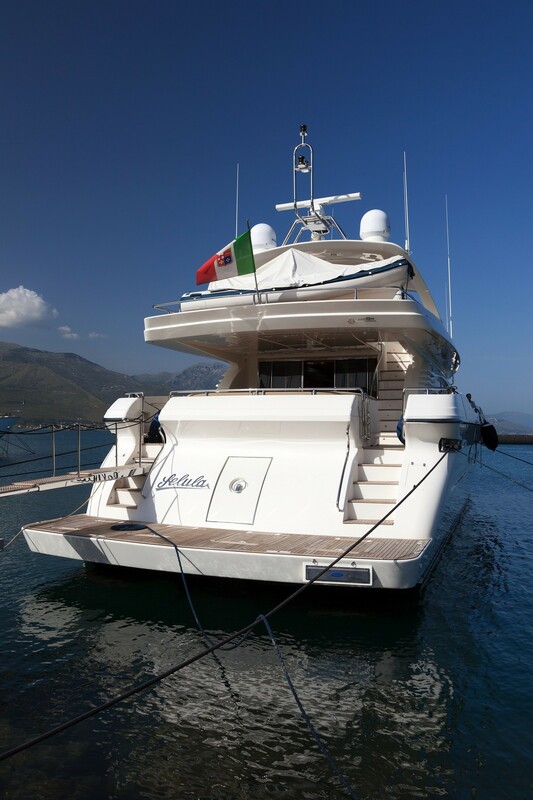 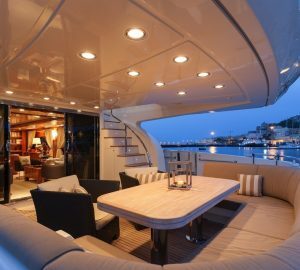 The yacht ZAMBEZI (ex SELULA) is based in Gaeta (Rome) but can be available elsewhere in the Mediterranean upon request. 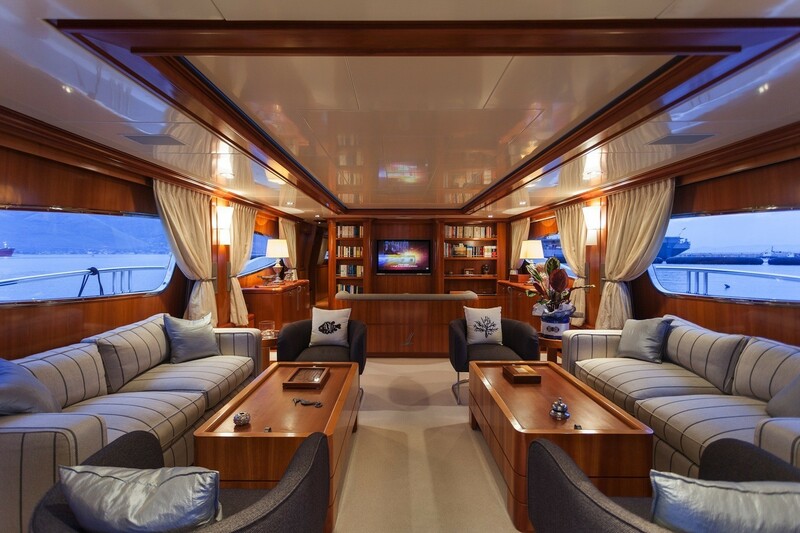 Luxury motor yacht ZAMBEZI can accommodate 10 charter guests in 4 stately tasteful cabins. 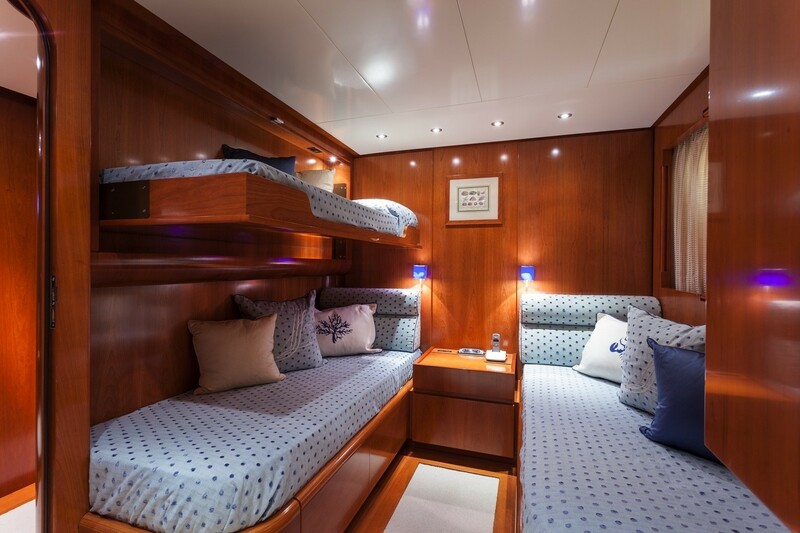 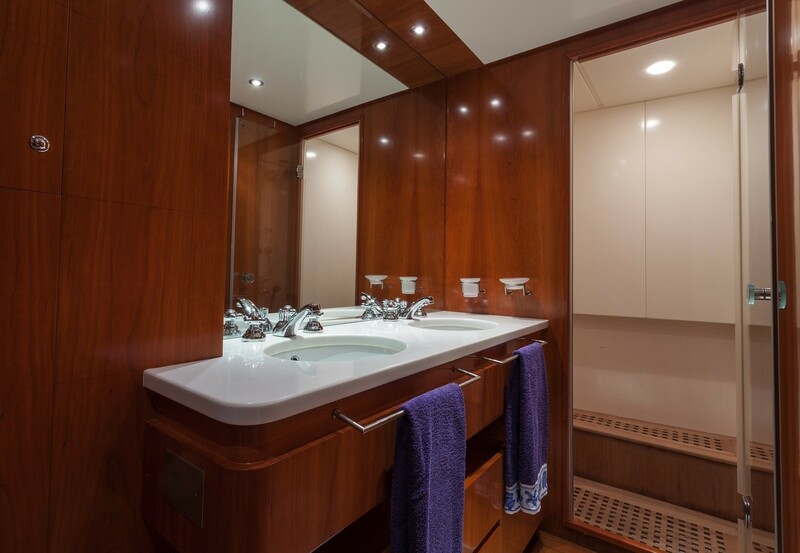 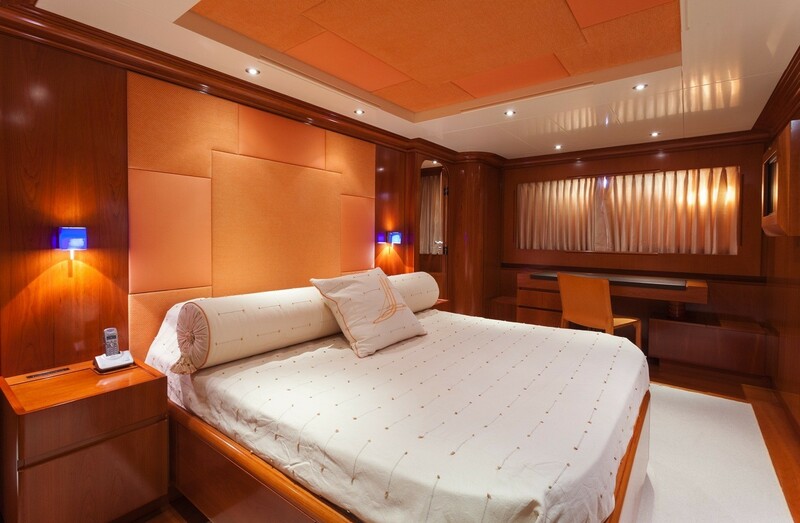 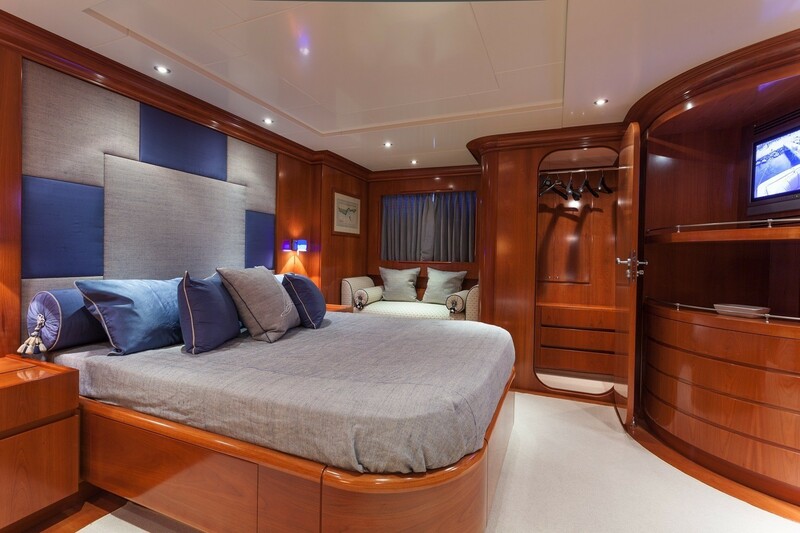 The master suite is aft amidships and full beam of the yacht with a center lined queen size bed, love seat, vanity, walk-in wardrobe and en-suite facilities with his and hers sinks. 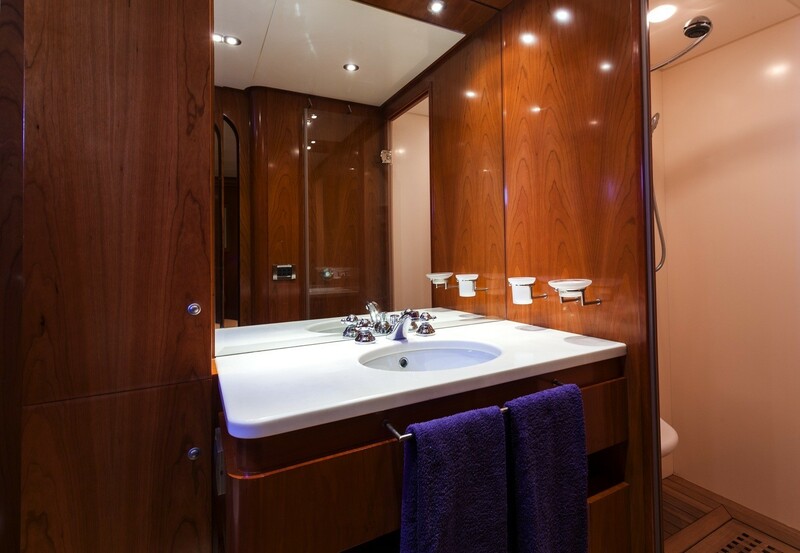 The VIP cabin is forward amidships and full beam of the yacht with a double bed, love seat, vanity, walk-in wardrobe and en-suite facilities. 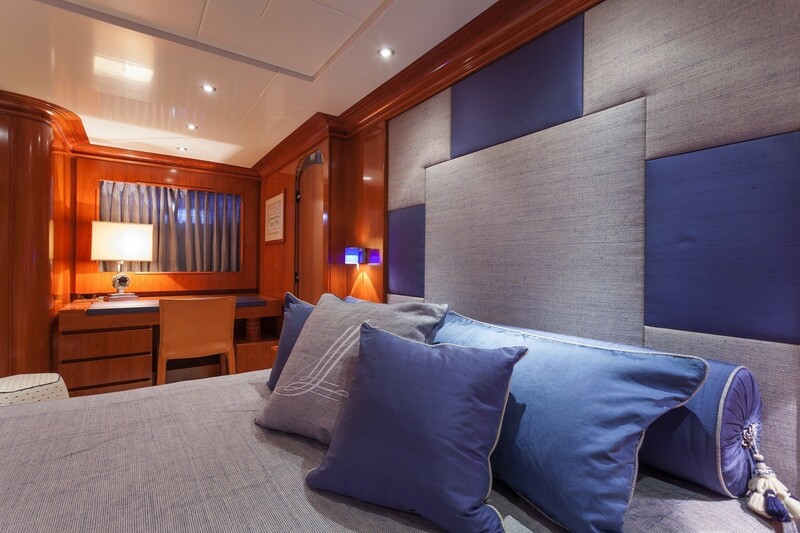 A further 2 cabins are on port and starboard amidships offering 2 single side by side beds and an upper Pullman berth each, both cabins offer en-suite facilities.